. 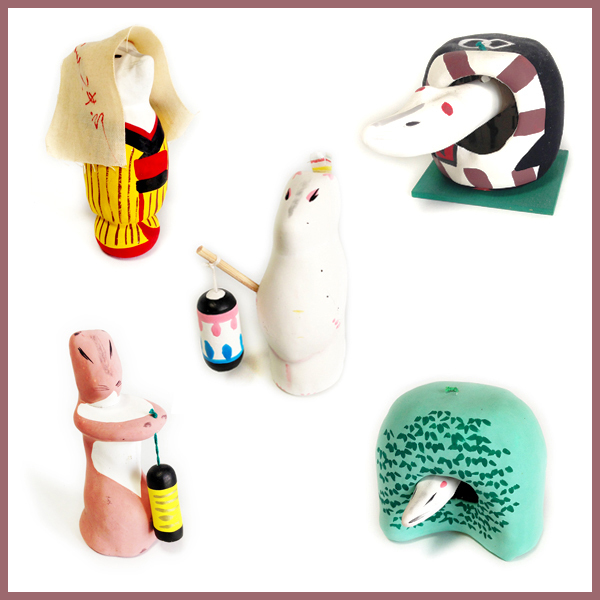 Tottori Folk Art - 鳥取県　.
. kitsune densetsu 狐伝説　fox legends . 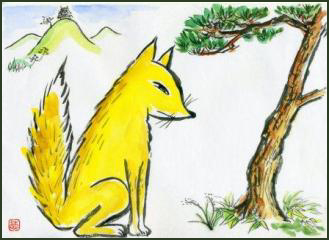 Hikyakugitsune, hikyaku kitsune 飛脚狐 the Fox messenger "with flying legs"
Kyozobo / Keizobo was an old fox that lived close to the Tottori castle. He could run to Edo and back in just two days and was famous for his speed. The Lord Ikeda 池田 of the Castle was very fond of him. One day Keizobo was sent on a secret mission to Edo and passing 播磨国 Harima no Kuni (Hyogo), he passed a trap of a farmer, who had placed a delicious-smelling fried rat. Since he was on an urgent mission, he passed on. On his way back from Edo he was hungry and wanted to get the rat, but in turn got caught in the trap himself and was killed. Lord Ikeda grieved about his friend and had the shrine 中坂神社 Nakazaka Jinja built in his honor. 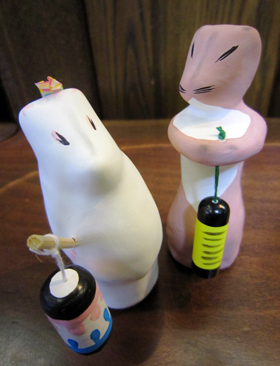 Now popular papermachee toys of Kyozobo of the fox are also made. the "fox with flying legs"
. 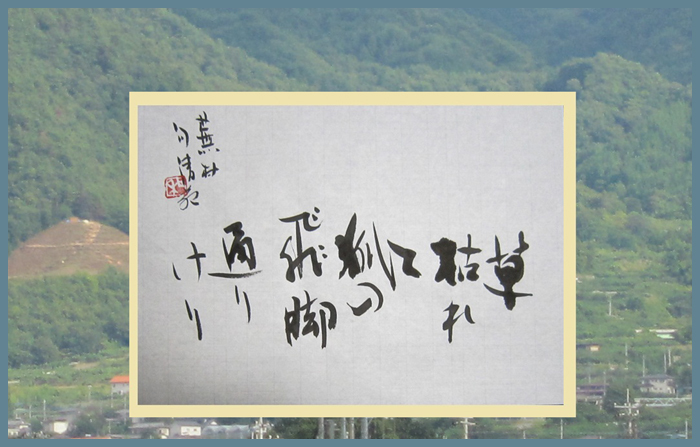 Yosa Buson 与謝蕪村 and Fox Haiku .
. hikyaku 飛脚 courier, messenger "flying legs" . hikyaku are the express messengers of the Edo period. In a legend from 若桜町 Wakasa, Yazu district, there is a legend from the 立見峠 Tatsumi Toge Pass. A fox vixen was busy bringing up her children. She had brought her foxies to the oil store of 油屋宗兵衛 Aburaya Sobei and had them lick on the oil every day while Sobei was taking a nap. To show her gratitude when the children had grown up, she transformed into a prostitute and sold her body to a brothel in Kyoto. The money she got went to the poor Sobei, who could finally enlarge his business and become prosperous. CLICK for more photos of this famous fox ! shoro shoro ショロショロ. There lives a fox, transforming into a beautiful girl, cheating and betraying people. She looks like a white fox with a lantern. Onji is a region in Iwami, Tottori, 鳥取県岩美郡岩美町. On the way to Iwai onsen Iwai 岩井温泉 Hot Spring there lived a trickster old fox. He came out with a lantern, pretending to help people and leading them into the forest. He is shown as a brown fox with a yellow lantern. 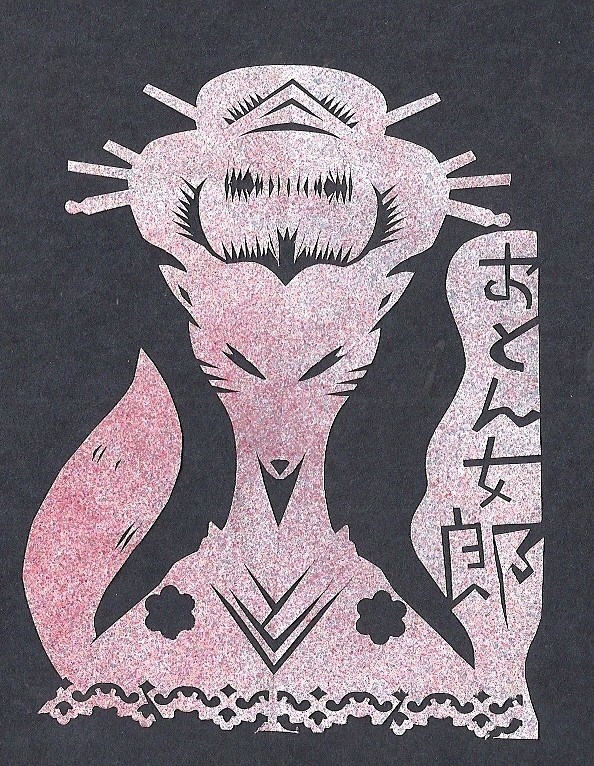 onashigitsune, o nashi kitsune 尾無し狐 "fox without a tail"
At the pass of Mount Nagao 青谷の長尾の山 there lived an old fox, transforming into an old lady and playing pranks on people, often very unpleasant ones. If someone suddenly shows symptoms of mental illness, they say he is bewitched by a fox. 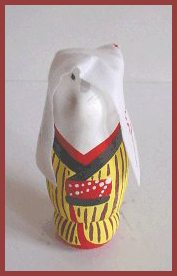 a Yamabushi can perform rites of exorcism by rattling his sacred wand near the pillow of the bewitched person. 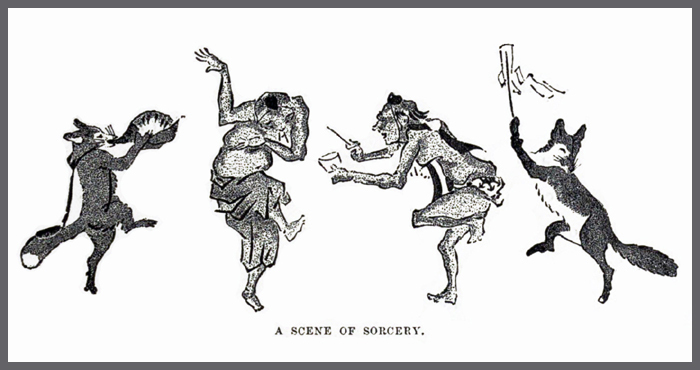 Once a child was bewitched by a fox. The local priest came to her bedside and blew his ritual conch all night. But the child died in the morning. sawarimono サワリモノ is the local dialect for being bewitched by a fox. This can be healed by performing special rituals. Now this type of illness is rare in the village. The daughter of Tane no Tosuke was a fox. The fields of his family, who always helped the foxes, always brought rice grains (tane) and planted them in his fields, so he had a rich harvest. Once a farmer helped a fox out of a trap and set him free. To show his gratitude the fox transformed into a woman, became his wife and brought great riches to the farmer. He became the elder of the village. Now the woman/fox thought she had done enough good for the farmer and disappeared back into the forest.
. Ariwara no Narihira 在原業平 (825 - 880) . Not long ago, O-Haru lived in Tottori town. Near the town office was a lodging, where she transformed into the Lady of the Hotel and cared for the travellers. She was a well-educated fox and could even perform the tea ceremony for the visitors. She also told them stories about Toyotomi Hideyoshi and his fight at Tottori castle. Once upon a time there lived a fox called O-Natsu near the Castle of Tottori. At the temple 興徳寺 Kotoku-Ji there lived a clever young monk who succeeded in swindling the fox out of her 宝物 special treasure. 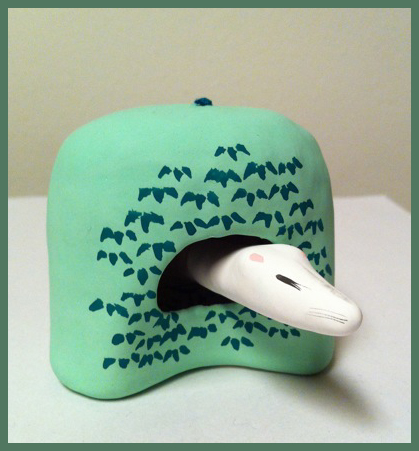 When the monk was not at home, the fox transformed into the shape of his mother and got the treasure back. So the young monk transformed into 諏訪明神 the deity from Suwa and got the treasure back again. One day it became known to the monk that the lord was to pass the temple, but he soon realized it was a ruse of the O-Natsu. So finally he caught the fox and beat it to death. If farmers wear new straw-sandals in the evening, they will be cheated by a fox. If someone suddenly develops a high fever, they say he is bewitched by a fox. 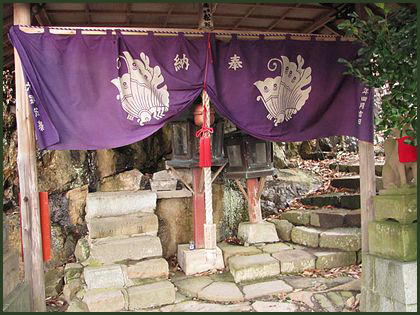 Exorcism is performed at the shrine 梶並神社 Kajinami Jinja and the fox is lured away with rice and beans 小豆飯. If someone shows symptoms of mental illness, or suddenly develops a high fever, they say he is bewitched by a fox and avoid him 忌避する. If someone shows symptoms of mental illness, they say he is bewitched by a fox.